With the October 28, 2018 Sunday strip Henry ceases its King Features syndicated run. The daily strip ended with the Saturday October 27, 2018 issue. 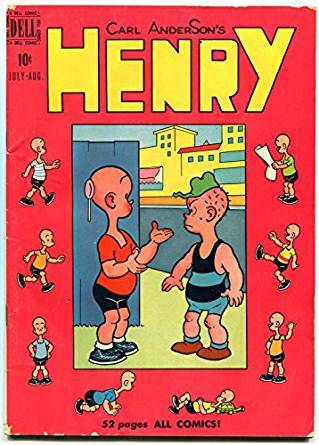 Henry by Carl Anderson first appeared as a (mostly) panel in the Saturday Evening Post issue of March 19, 1932 and ran there until February 2, 1935. King Features and Carl Anderson converted the panel into a strip and began daily syndication of the character on December 17, 1934. It was soon joined by a Sunday page on March 10, 1935. With a note that some claim that Don Trachte retired in 1993 and that is when the new Sundays ended. Was Trachte far enough ahead of deadline to retire in 1993 and new Sundays to last into 1995? – and that’s why we love him. *No mention on the fate of Henry as distributed by the King Features Weekly Service. The New York Eagle News, which publishes on Thursdays, printed Henry in its November 1, 2018 edition, and replaced it with Tiger in the November 8, 2018 issue. 27 queries in 0.171 seconds.